Porcelain veneers have quickly become the preferred option to drastically enhance the appearance of smiles due to the impressive and drastic results they produce. For those who have misshaped teeth, severe tooth discoloration, or other cosmetic flaws, porcelain veneers can give you the dazzling smile you’ve always wanted. Using a simple and noninvasive procedure, we’ll cover the defects to make your teeth more aesthetically pleasing with a natural-looking solution. As a cosmetic dentist, we proudly offer porcelain veneers in Fort Worth to give you an amazing and confident smile. Porcelain veneers are thin false fronts that are made from porcelain and bonded to the front side of the teeth. The thin shells are customized to give you the exact appearance, color, size and shape you want for a more attractive smile. Veneers are different than other forms of veneers because they are thinner, which means less of the tooth’s structure is removed during the bonding process. In addition, porcelain closely mimics enamel for a natural new smile. 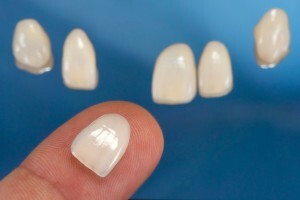 Porcelain veneers are fairly versatile and can be used to correct a number of flaws. For example, those who have severe tooth discoloration that doesn’t respond to whitening treatments can get a whiter, brighter smile. Veneers are ideal for hiding chips, cracks, and abnormally shaped teeth because they give teeth a shapelier appearance overall. This is perfect for those who have shorter than usual teeth. In some cases, veneers can also be used to make the teeth appear straighter. With custom-made veneers, we can fill small gaps and make slightly crooked or overlapping teeth appear straighter. To benefit from porcelain veneers, you’ll first need a consultation with your cosmetic dentist in Fort Worth. If it’s determined veneers are right for you, we will create a customized treatment plan to give you an amazing new smile. We will begin the process by cleaning your teeth. Then, we will prepare the teeth by lightly removing a small amount of enamel to create a more secure bond between the veneer and the tooth. We will then take images and impressions to create your new veneers. While you wait for your veneers to be made, we will attach temporary veneers. Once your new veneers are ready, you’ll come back to the office so we can remove the temporary veneers and bond the permanent veneers to your teeth. To keep your new smile looking great, you’ll need to practice proper oral hygiene using nonabrasive products. You’ll also need to avoid certain habits that can cause damage to the veneers, such as chewing on ice or using your teeth as tools. Finally, you’ll need to visit your dentist regularly for checkups and cleanings. With the right aftercare, your new veneers will last an average of 10 years before needing replaced. As your cosmetic dentist, we are here to see you smile. We’ll give you the confident smile you’ve always wanted with porcelain veneers in Fort Worth.